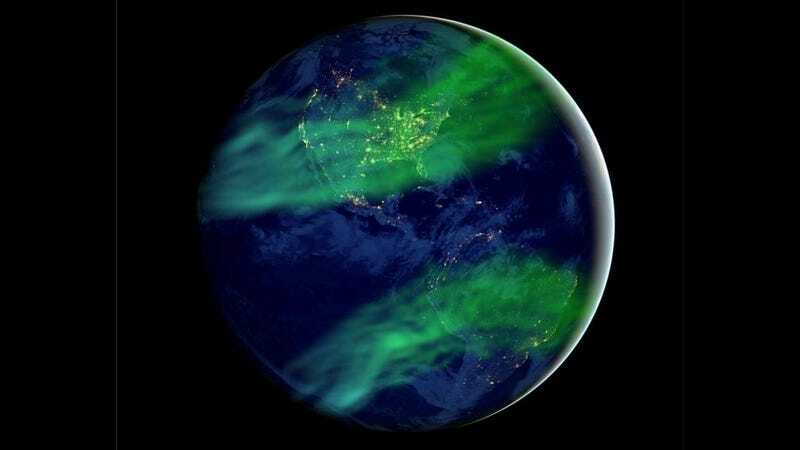 Over the past couple of hundred years, the strength of the Earth’s geomagnetic field has been waning, leading scientists to wonder if our planet’s polarity is on the verge of flipping. A new study suggests this won’t happen in the near future—and that the intensity of today’s field is uncharacteristically strong. Predicting a geomagnetic flip is important for two primary reasons, one biological, one technological. The Earth’s magnetic field deflects solar wind and cosmic rays, so with a weakened field in the process of flipping—which can take upwards of 1,000 years—more radiation would get through. This would leave biological life exposed to the ravages of solar radiation, leading to serious health issues and genetic mutations. It could even result in mass extinctions; scientists speculate that previous polar flips have done exactly this. A polar flip would also fry our technological infrastructure. It would be bad for satellites, power grids, and sensitive equipment like pacemakers. But as a new study published in the Proceedings of the National Academy of Sciences points out, we have nothing to worry about for the foreseeable future. The geomagnetic field may be decreasing rapidly, but it’s not yet down to the long term average. Not only that, it could even start to build itself back up in the opposite direction at any time. Our planet’s magnetic poles have flipped many times during its long history, but they tend to occur at random intervals. A flip won’t happen for about 40 million years, and then suddenly there will be ten flips over the course of a one million year span. Scientists have had no luck nailing down any kind of periodicity, probably because none exists. The average duration between flips tends to be about a few hundred thousand years. Earth hasn’t experienced a reversal in 780,000 years, leading some scientists to speculate that we’re due. But given that there’s no schedule, it’s probably be best to avoid such language. Yet it should be possible to predict a polarity switch. When the geomagnetic field intensity is significantly below its historical, long-term average, a geomagnetic swap may be on its way. The new study suggests we’re nowhere near this point, and we won’t be for another 1,000 years. Left: Magnetic field lines when the poles are polarized. Right: Magnetic field lines during a prolonged reversal event (Credit: NASA). Scientists from MIT and Columbia University’s Lamont-Doherty Earth Observatory arrived at their conclusion by analyzing ancient rocks erupted from volcanoes on the Galapagos Islands. This site was chosen because these islands are situated right on the equator, where the strength of the Earth’s magnetic field is exactly half of what it is at the poles. When lava cools, iron-bearing minerals within in it act like tiny magnets, which align with the Earth’s magnetic field. Scientists analyze these rocks to determine both the direction and intensity of the magnetic field as the lava was cooling. The researchers found that the time-averaged geomagnetic field intensity over the past 5 million years is about 60% of the field’s intensity today. Much more at MIT News. And read the entire study at Proceedings of the National Academy of Sciences: “Weaker axially dipolar time-averaged paleomagnetic field based on multidomain-corrected paleointensities from Galapagos lavas”.